Already without both side poles (300 g) it looks good, with them – like a rock in the surf. Continuous rain and wind have no chance. With the Quadratic, The Theory Works offers an innovative, individually configurable all-rounder with terrific value for money. Read more of their comments here. Choose the components that match your needs. Optimise the pole structure for weight or strength. Create different setups for different trips. Uncountable adventures. One tent system. Components to extend your tent system. 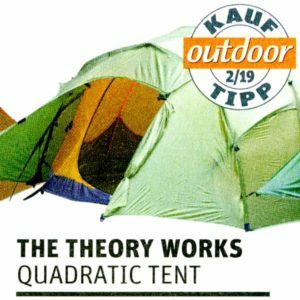 Overall, the Quadratic tent system left a very good impression. The processing of the individual components is excellent and the system generally well thought out… … No matter which combination you choose, the price is quite fair for the offered quality and the unique modularity. If you travel a lot in different regions and / or in all seasons, such a flexible tent system could certainly be worthwhile. From one to six people. Pitch to suit the terrain and weather. Superior materials for durability in difficult conditions. See all the customizable shelters. Components to make your system more versatile.